from Designs in Machine Embroidery, Machine-Embroidered Wraps and Cozy Cover-Ups. In this 64 page book, Joanne Banko shares tips and techniques for adding designs to a variety of styles of wraps. 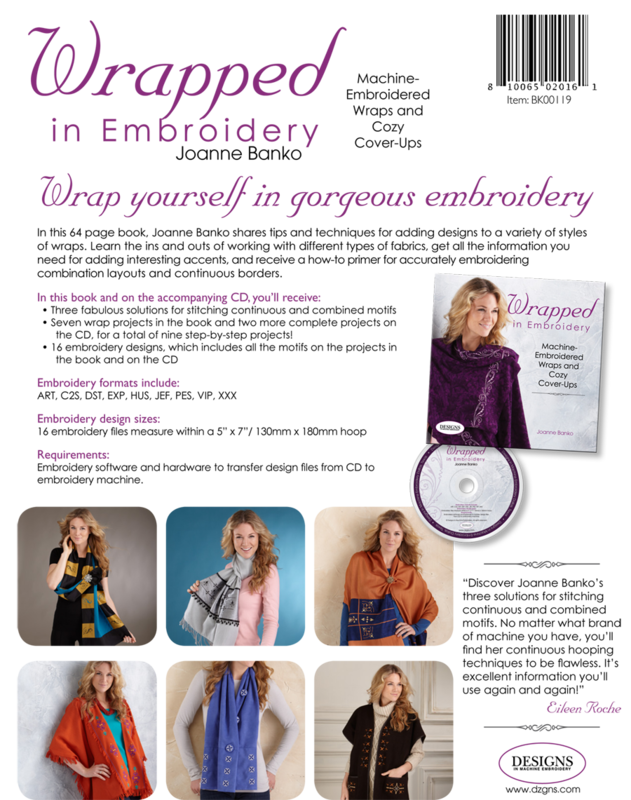 In this 64 page book, Joanne Banko shares tips and techniques for adding designs to a variety of styles of wraps. Learn the ins and outs of working with different types of fabrics, get all the information you need for adding interesting accents, and receive a how-to primer for accurately embroidering a combination layouts and continuous borders. Seven wrap projects in the book and two more complete projects on the CD, for a total of nine step-by-step projects! Embroidery software and hardware to transfer design files from CD to embroidery machine. I love Allbrands customer service and products. This item I purchased at a trade show and it failed to get in my bag. I just called and it was here in just couple of days. Thank you!